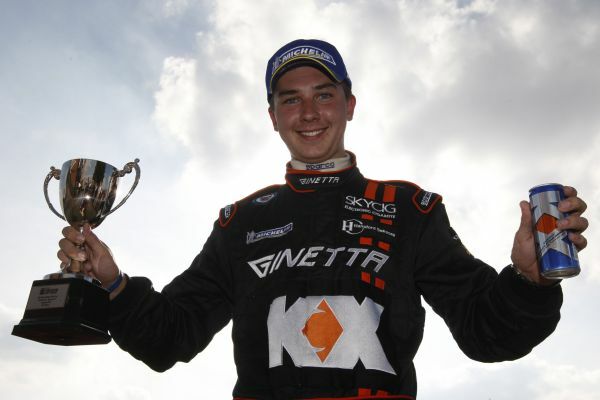 Tom Ingram has vowed to redouble his efforts to clinch the Ginetta GT Supercup crown in 2012 after cruel misfortune cost him victory and a hatful of points in the sixth round of the campaign at Snetterton – leaving the talented young High Wycombe-based speed demon to concede that ‘podiums will no longer be enough’. Ingram travelled to the Norfolk circuit – the only one on the calendar at which he has yet to win – bidding to quash that unenviable statistic and further erode the 37-point deficit separating him from the championship leader in the BTCC-supporting, ITV4 live-televised sportscar series. With a striking new livery on his JHR Developments-run Ginetta G55 to reflect his recent recruitment by the prestigious KX Akademy, Ingram was buoyed by strong form during practice, and headed into the weekend bullish about his prospects. “I got a mega start and stayed in front for the first couple of laps,” he recounted, “but I was under pressure from the championship leader behind and concentrating on keeping him at bay. I was having to defend pretty hard, but as we went through a long left-hander, I was so focussed on trying to box him out that I didn’t notice how close the driver in third was, and as we were busy battling each other, he managed to sneak past us both. Barely a second shy of the winner when the chequered flag fell, the manner in which Ingram expertly and valiantly fended off his two chief adversaries despite his issues was impressive indeed, and he was quick to praise the JHR Developments boys for burning the midnight oil to rectify the problems by the following morning. Beginning race two full of optimism, an ‘unbelievable’ start vaulted the 18-year-old KENNETT brand ambassador immediately into the lead from second on the grid, and by the end of a storming first lap, he had already established a 1.3-second advantage over the rest of the field, with his arch-rival only fourth. It was a perfect scenario, but mere moments later, smoke filling the cockpit signalled that all was far from well, and as his engine blew shortly afterwards, Ingram’s Snetterton curse continued. “That was a real kick in the teeth,” he acknowledged, “but the team worked ridiculously hard again to change the engine in time for race three, which I would begin plum last. I spoke to my KX Akademy mentor Jason Plato about my tactics, and I was really fired-up for it; I told him I would just have to ‘do a Plato’ and fight my way through from the back! 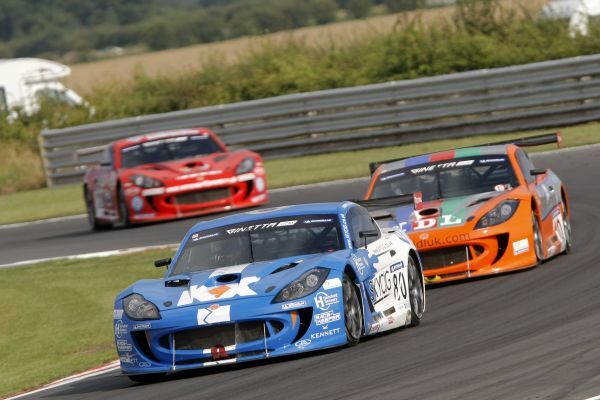 Lapping comfortably quickest, it was a truly heroic performance as the reigning Ginetta G50 Champion and former Ginetta Junior Champion and British Karting Champion scythed his way through the order from 17th to fifth at the flag. Notwithstanding his stellar charge, however, Ingram knows that his Snetterton troubles have left him well on the back foot at 72 points adrift of the championship lead – and with only one viable strategy from hereon in.